Did you know an informal poll conducted in the Dallas Ft. Worth showed that the name most associated with the words “credit card’ was Chase? It’s true. And while this was an informal poll with no scientific backing, it wouldn’t come as a surprise to learn that even with all of the scientific formulas, the results would be the same. Last year, we learned Chase would be the first credit card company to offer a co-branded card that has the new smart chip technology that’s already common in Europe. This technology, of course, was designed to greatly reduce fraud. The co-branded effort was between Chase and British Airways. Both ran heavy marketing campaigns in the U.S. and the result has been an overwhelming support for both mega-giants. Despite this, the other card companies continue to lag behind as they work to find a way that will bring the technology to all credit cards without forcing merchants, and specifically small businesses, into major monetary investments. With that in mind, we thought we’d check in on Chase and explore a few of its offers. This is a fine business card for both small and medium sized businesses. First up, you’ll receive a 2,500 bonus points with your first purchase; this equates to $250 in rewards. Spend $10,000 within the first three months of opening your account and enjoy an additional 25,000 points. One of the best features associated with this card is the flexibility of being able to pay your balance in full each month, as you would a traditional charge card, or break your payments up if you’d like. Enjoy six months of 0% APR on both your purchases and balance transfers with the Ink Plus with Ultimate Rewards. You’ll also pay no foreign transaction fees and get as many employee cards as you need. The $60 annual fee is waived your first year. Enjoy premium travel benefits and complementary airport lounge access. Monitor your spending, and the cards held by your employees, with the easy to navigate and recently redesigned Chase website. It’s an ideal choice for business owners of all size and with the Chase name behind you, you’ll have access to all the services that make Chase the popular company it is. This is definitely one of Chase’s most popular card offers. It includes Blueprint, which is ideal for those looking to rein in their spending. A $75 statement credit after you you make $300 in purchases during your first three months adds to the many benefits and the 15 month 0% APR intro tops that deal off. Want more? How about no annual fee – ever – it’s what you get with the Chase Slate MasterCard. It consistently does well with customer satisfaction, too. Another popular Chase product, this credit card comes with a $100 cash back bonus after you make $500 in purchases during your first three months of membership. The APR rate is as low as 9.99% after a 15 month 0% intro rate, making it a great choice for those with stronger credit ratings and who are looking for an impressive rewards credit card. The rotating categories allow you to choose the top three that you’ll use most often. There are 15 categories to choose from and you’ll earn an additional 5% cash back opportunities that rotate throughout the year. You’ll earn unlimited 1% cash back on all your other purchases. We like Chase Freedom Visa too because the cash back rewards never expire, there’s no annual fee and you can even maximize your savings with additional 10% cash back when you shop through the Chase website at merchants you already do business with. The Chase Blueprint has many benefits that sweeten the deal even more, including a 15 month 0% intro APR for purchases. Depending on your credit history, after the intro rate expires, your APR can go as low as 11.24%. This is an easy to use card with the kinds of benefits you expect from Chase. We like this choice because of its streamlined design. The Blueprint technology is part of this offer, which is a powerful way to better manage your money and your credit. No worries about theft, either with the zero fraud liability and several money management tools are included, too. 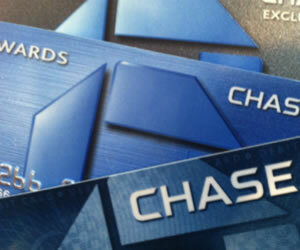 This JPMorgan Chase card is a no annual fee credit card that more meets the needs easily of millions of consumers. With this co-branded offer, you will receive 50,000 bonus miles after your first purchase, an additional 25,000 bonus miles after you spend $10,000 during your first year and then another 25,000 bonus miles if you spend another $10,000. The rewards are plentiful for this credit card choice that requires an excellent credit rating for approval. The new smart chip technology works both here in the U.S. and the UK, too. No worries that the technology hasn’t caught up with American based companies – you’ll not have any problems. It should be noted, too, British Airways Visa Signature Card surged in popularity once the new technology was announced, which adds legitimacy to the technology as it’s being blended into the mainstream financial sector here in the states. These are just a few of the many impressive Chase credit card offers. With the first step towards the new chip technology, it’s easy to understand why this bank remains a world leader for all things financial, including its strong credit card offers. Whether it’s the co-branded Chase offers or the business credit cards or the classic consumer cards with rewards and cash back opportunities, finding the right solution for your financial needs is easily located with this family of credit cards. As always, be sure to carefully review the terms and conditions. This is where you’ll find the details associated with any off you’re considering. With the changes that came with the 2009 CARD Act, it’s important to understand how the new law affects you, your options and ultimately and your credit history.